Managed Care Plans Make Progress In Erasing Racial Disparities : Shots - Health News Though blacks still lag whites nationwide in health, disparities have been largely eliminated in the western states, a study finds. Kaiser Permanente's Medicare HMOs did best on that. 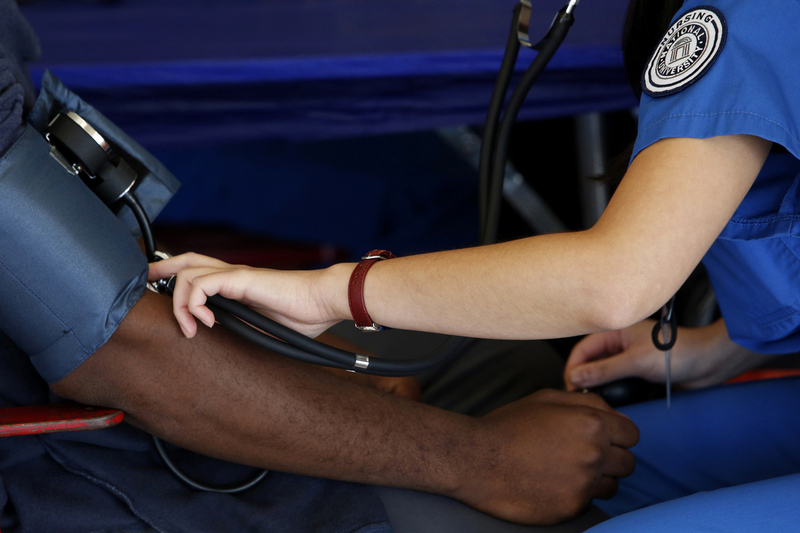 A nurse checks a man's blood pressure during a health clinic In Los Angeles. Years of efforts to reduce the racial disparities in health care have so far failed to eliminate them. But progress is being made in the western United States, due largely to efforts by managed care plans to identify patients who were missing out on management of chronic diseases like diabetes and heart disease. While management of blood pressure, cholesterol and blood sugar improved nationwide, African-Americans still "substantially" trailed whites everywhere except the western U.S., an area from the Rocky Mountains to the Pacific as well as Alaska and Hawaii. "We were certainly hoping we would see indications of progress in eliminating disparities in the country as a whole," said Dr. John Ayanian, who heads the Institute for Healthcare Policy and Innovation at the University of Michigan and was lead author of the study. While it was "disappointing" that disparities persisted, he said, "it's also heartening to see that ... in the West, the disparities had been eliminated, and that was both surprising and encouraging." To find that out, Ayanian and his colleagues looked at 100,000 Medicare patients who were enrolled in HMOs, called "Medicare Advantage" plans, from 2006 to 2011. The study was published last week in the New England Journal of Medicine. Disparities in health care have long been noted in American health care. The researchers wrote that, in 2008, "life expectancy was 5.4 years shorter for black men and 3.7 years shorter for black women than for white men and white women." Heart disease and diabetes — diseases that can be better managed by controlling blood pressure, cholesterol and blood sugar, the risk factors measured in the study — accounted for 38 percent of the gap in mortality between black and white men, and 54 percent of the gap among women, the researchers said. That's why closing the racial gap on these measures is so critical. "It's one of the first large studies to show that it's possible to eliminate deeply ingrained racial disparities in important risk factors," Ayanian said. He said that outcomes for Hispanics, and Asians and Pacific Islanders were "also encouraging." Nationwide, black enrollees in the study were substantially less likely than white enrollees to have adequate control of blood pressure, cholesterol and blood sugar, trailing whites by about 10 percent. Hispanics were 1 to 3 percent less likely than whites to have blood pressure, cholesterol or blood sugar under control. Asians and Pacific Islanders were more likely than whites to have good control of blood pressure and cholesterol. Blood sugar control was about the same. Specifically, the researchers pointed to Kaiser Permanente health plans as being successful in eliminating disparities. Kaiser includes "nearly half" of Medicare HMO enrollees in the western region of the U.S., Ayanian said. "Our findings in the West of nearly identical control of three major risk factors among black Medicare enrollees and white Medicare enrollees in Kaiser health plans and control of (blood sugar) in other health plans show the potential to achieve equity in these key health outcomes," the researchers wrote. Kaiser representatives said they did not have any advance knowledge of the publication of the study. Dr. Joseph Young, who leads Northern California Kaiser's clinical hypertension program, said that Kaiser adopted a population management approach to managing chronic conditions in 2006. Kaiser has created registries for people with various kinds of conditions, so that patients who might be missing preventive care or better management of disease can be easily identified. In the area of blood pressure control, Kaiser changed its drug formulary to allow a "combined pill — a single pill that includes two drugs, to make it easier for patients to take their medication. These population-based strategies resulted in big improvements in overall outcome for Kaiser patients. Young said that during the 2000s, very serious heart attacks ... fell by 62 percent, and our stroke mortality fell by 42 percent. Kaiser does have some remaining racial disparities in its non-Medicare population, and Young said they are "actively focusing" on closing those remaining gaps. "We want clinicians to do what Kaiser is doing and take seriously to provide high quality race-blind clinical care," says Dr. Anthony Iton, who leads the Healthy Communities initiative at the California Endowment. "Kaiser is showing it can be done." He called the study "very hopeful" and believes that Kaiser's approaches are replicable elsewhere. "Any other system that says it's not doable has to explain how they can justify not providing the same high-quality care to everyone that comes in the door," Iton said. California probably has "less of a socioeconomic spread between whites and blacks than you do in the southeastern United States," Iton noted. "It's a heavier lift in the Southeast than in the West. But despite that, it's clearly doable."